You'll think you've died and gone to heaven! This luxury cabin known as 'White Rapids Retreat' is located on the Buck Shoals gorgeous wide stretch of the Chattahoochee River near Helen, and is anything but ordinary. Relax and sleep to the sounds of the rushing river rapids just 50 feet from the cabin and enjoy the panoramic open views of the river while soaking in the hot tub. Complimentary Kayaks are included so you can enjoy some river adventure! This unique section of the river directly behind the cabin is your own private water amusement park: enjoy swimming, sunning and relaxing on the sandbar in the middle of the river, tubing / kayaking / rafting from behind the cabin, playing on the natural rock waterslides, and exploring the rock shoals of the river. The fishing is excellent behind the cabin for shoal bass, striped bass, catfish, and bream. The kids will love climbing trees and playing on the tire swing on the property. Your stress will melt away as you catnap in the riverside hammock. The screened porch overlooks the river and has satellite TV so Dad won't miss any of the football game. Flat Screen HD TV's with Directv receivers have Smart TV Roku built-in so you can log into your Netflix account and enjoys movies and wine by the living room stacked stone fireplace. Any gourmet chef would be delighted by the beautiful kitchen, Viking Style gas grill outdoor kitchen unit on the deck, and charcoal grill down by the river. The picnic table next to the river makes the perfect place for a Sunday afternoon cookout. Your kids will never forget the family nights spent around the riverside flagstone fire pit with Adirondack chairs telling ghost stories, catching fireflies, and roasting marshmallows. Drink a cherry Coke on the front porch swing and you'll feel like your back in Mayberry. Nature lovers should keep an eye out for the wild deer and Canadian geese in the backyard while sipping your morning coffee. This property is very private and secluded on 5 acres of wooded property, and the opposite side of the river is part of a state park. Enjoy nature walks through the woods on the property. The interior of the cabin is beautifully decorated with rustic log furniture and antique motif. Whatever your age or interests, there is something for everyone at this extraordinary river cabin retreat. Guests consistently remark that they have never seen a more breathtaking river view property as this one!!! This is the ultimate river cabin vacation experience!!! Our family used to live in South Florida. I am a Physical Therapist, Marisol is a Pharmacist. We wanted to have a vacation property to escape to with the kids and build family memories through the years. I wanted a place in the Florida Keys. Marisol did NOT. I am glad I listened to my wife. We have spent the past 15 years vacationing to this property with our family and have created so many wonderful family memories right there on the river. We gradually fell in love with the North Georgia mountains and relocated to this area with our family. There is a plaque on a rock down by the river that says 'A little peace of heaven'. And that is exactly what this property is. I am never happier than I am at this property spending time with family and friends. Now that I live only 30 minutes away from White Rapids Retreat, I am able to come over once per week and perform regular maintenance, repairs, and make improvements to the property, so year by year we gradually add amenities and make upgrades for everyone's enjoyment. This property is located 1.5 hours drive from Atlanta, so you can either drive there or fly into Atlanta and rent a car for a short drive. We looked at alot of properties in North Carolina, South Carolina, and North Georgia. Our family loves the river, so we were only looking at river properties. There were alot of options, but we wanted a river with rushing rapids to play in and the sound of the water to lull you to sleep in a hammock. Most properties are either slow moving water, or the house is too far away from the river. The moment we saw this property, I told the realtor 'This is it'. We actually ended up in a bidding war with another buyer over this property. We won!!! It has been worth every penny. We would like to share this property with you and your family to enjoy. There are so many things to do at the cabin, in the river, and in the North Georgia area, that I can't pick just one. Mostly, we just love spending time with family and friends experiencing what 'a little piece of heaven' is like. 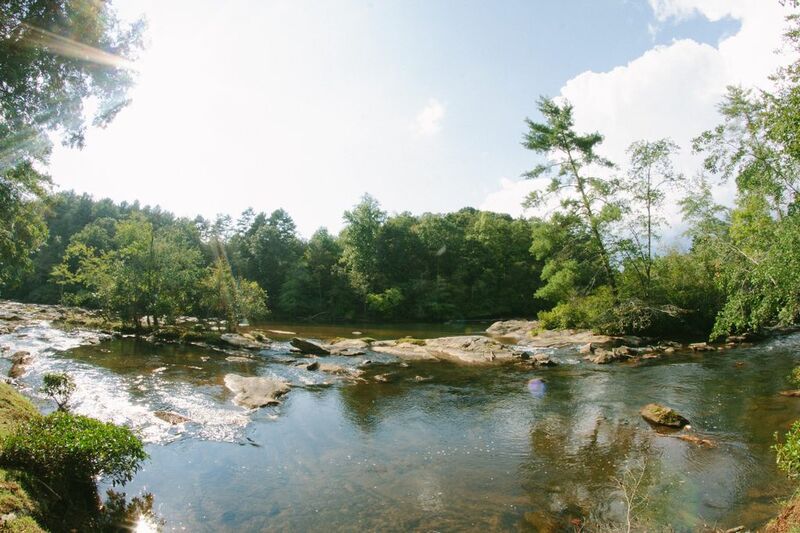 Located directly on wide panoramic portion of white water rapids on the Chattahoochee River. We have 2 sit on top kayaks for use by our guests. One is a tandem kayak, the other is a solo kayak. We also provide you with life vests, paddles, and helmets. Located on deck overlooking river. Picnic Table next to the River, Hammock next to the River, Tire Swing. Perfect mountain getaway on the Chattahoochee River. We have six kids and this home fit us perfectly. I loved the screened porch area and that we could open the French doors to make the living space bigger while the weather was cool. We fished, kayaked, splashed around in the water, enjoyed the tire swing and the fire pit in the evenings. The house was clean and the bedding was comfortable. The kitchen was well stocked with utensils, plates and bowls as well as pots and pans for cooking. We will definitely stay here again. We loved our stay even though it was freezing cold and torrential rain! We still enjoyed the hot tub and some games! We all ran to the top of the crazy steep (paved) driveway to get some energy out! The view was beyond amazing and we found all that we needed in the kitchen. The beds were nice and comfy. Thanks for a lovely winter break! Everything about our stay was very nice. The home is comfortable and spacious. The location - what can I say?- fabulous. The house is right on the Chattahoochee with the sound of the rapids. I spent most of my time sitting on one of the two deck or on the screened porch. The sound of the river was very relaxing. The hot tub is an added bonus! This is a place I would like to go again when I need to recharge my batteries. Great Place, we will be back!! We had a wonderful time, and the location is great. The house was absolutely as advertised. Can't wait to come back. Our family had a wonderful “mini” pre-Christmas holiday stay here this week. It was a great property, with awesome solitude and access to the river. We all had a great time and would stay again - perhaps next time when we can enjoy the outdoors more. Thank you for sharing your home and amenities!!!! Everything worked out extremely well for us. Beautiful! Would love to experience again one day! It was a beautiful, clean place.. The river, hot tub n kayaks were a plus even though the rain, temps , kept us from fishing n kayaks...hope to come back one day! For a vacay and not a wedding! Tubing on the river behind the cabin.